To appreciate the beautiful season and protect yourself from excessive sun, what better than an 8' umbrella. With a crank and tilt function, this 8 ribs umbrella in steel is the ideal item. The Fall River Collection adds beautiful classic style and comfort to your outdoor living area. This umbrella features a premium outdoor weather resistant fabric, that is durable; stain, mildew and fade resistant. The Fall River umbrella is rectangular shapped for optimum coverage over the coordinating Fall River 7 Pc. Dining Set making entertaining outdoors a pleasure. Only use this umbrella with an umbrella base and always crank umbrella down, take out and store in a safe location. Create your own shaded backyard oasis with this beautiful Santiago 10-ft octagon umbrella. This large cantilever-style umbrella provides up to 71 square feet of optimal shade coverage without the pole getting in the way of conversation or entertaining. The smooth-working crank-style lift and locking tilt mechanisms make it super easy to adjust the height and angle of the large 10-ft canopy, providing the desired shade throughout the day. The canopy is crafted from high performance fade and weather-resistant Sunbrella acrylic fabric featuring a single wind vent that allows air to escape freely to limit wind damage. 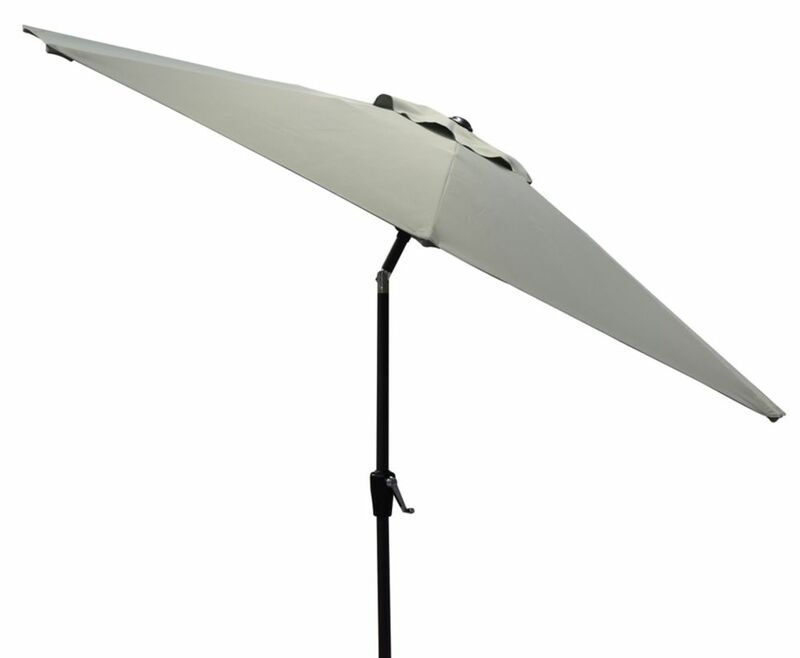 The offset pole design is much more versatile than the market style umbrella, allowing you to effortlessly move the shade where you need it the most. Sunbrella acrylic fabric canopy backed by 5 year warranty; 1 year warranty on pole and structure. 120-lb cross-arm base weights recommended (sold separately). Umbrella octogonal 8 ft. fabric top To appreciate the beautiful season and protect yourself from excessive sun, what better than an 8' umbrella. With a crank and tilt function, this 8 ribs umbrella in steel is the ideal item. Umbrella octogonal 8 ft. fabric top is rated 4.0 out of 5 by 1.